PLEASE NOTE A LOT has happened, but we have not had the time to do full write-ups. News, current photos, and community photos can now be found on our FACEBOOK page. We obtained rail! Going from having no rail to build track with to over 1500 feet in six months! The first 300 feet came from the old Schlage lock comany site and was donated by property owner Universal Paragon in Summer of 2014. Meantime, two miles south in Brisbane, a siding about 1300 feet long was going to be torn up by a contractor. 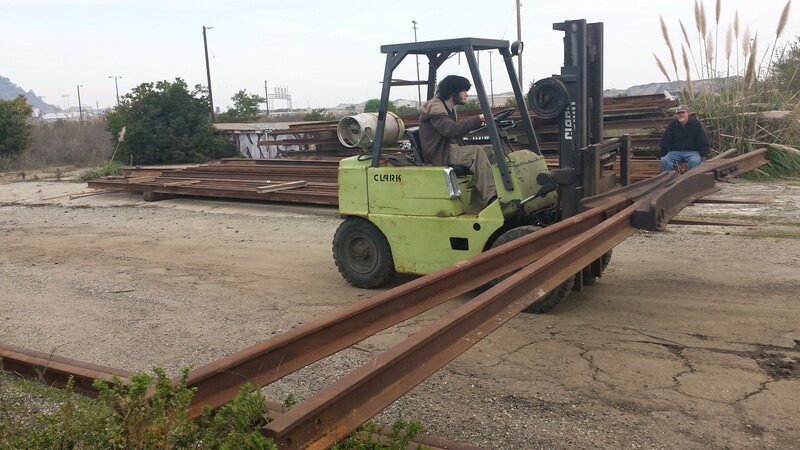 We were able to negotiate a deal with the contractor and purchase the rail at scrap value. Their method of ripping out the track damaged most of the switches but the rails and OTM was salvaged. Volunteers then sorted and staged the track and materials for future use. 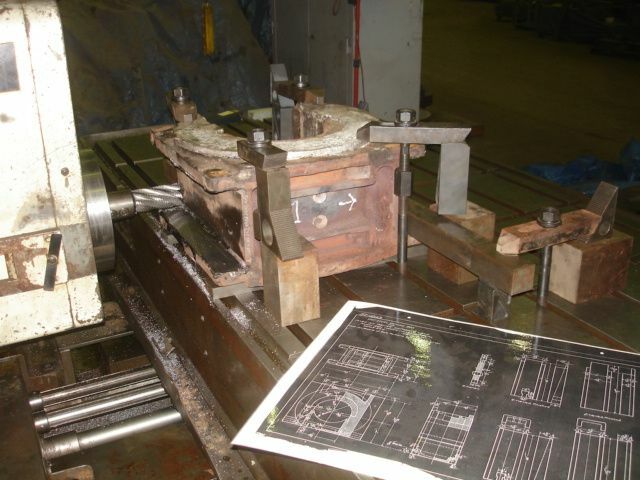 Here's some pics of the locomotive frame being milled. Project was to assure a tight fit of the liners (AKA shoes and wedges) to the frame pedestals. Too much looseness, or inaccurate measurement from averaging the numbers would translate to misfit drive boxes and cause uneven where on the axle journals. 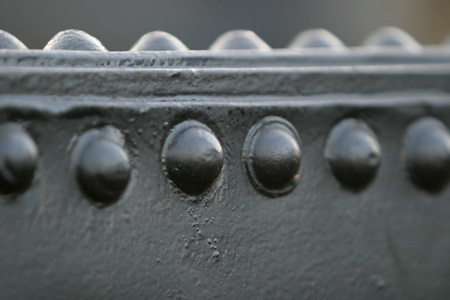 Heavy wear, especially at the third axle where the main rod connects, had left dishing and uneven, non-parallel faces. Out of the 24 faces (8 per axles), 11 where worn bad enough to face, and axle 3 got all 8 done. We accomplished this with great teamwork with three days of machining. The first day was a bust because the cutting head did not reach as far as the Climax company described. Ken took a piece of 3" round stock home and made an extension for the Weldon shank. You can see the extension in the photo. Ken also designed the mounting bars you see. 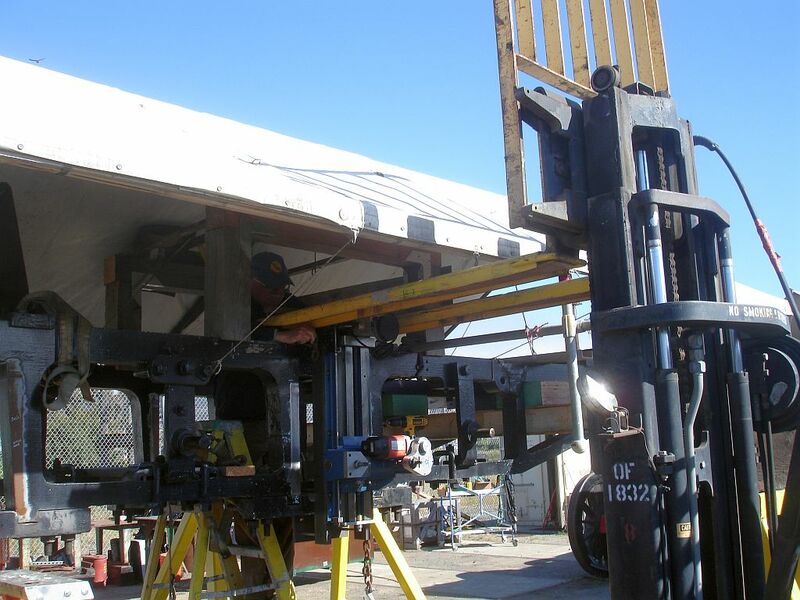 Hoisting the 350 lb machine in place was done by forklift from outside the frame, or chain hoist on gallows. You can see the gallows over axle 3 to give me the headroom for the chain hoist. We'd bolt it tight and indicated to the frame with set screws (you can see them on the side of the mill-right next to the black bolts that hold it to the parallel bars). Once one side was done, if we were doing another on that position, we'd indicate to the face we had just milled. Ken was able to dial within .002" with minimal fuss. It averaged about 2 hours per cut, considering all the time it took to move the machine, sometimes flipping it top to bottom, bolt up, indicate, cut with a 2" shell mill, and then trim the corners of the cut with a 5/8" end mill. 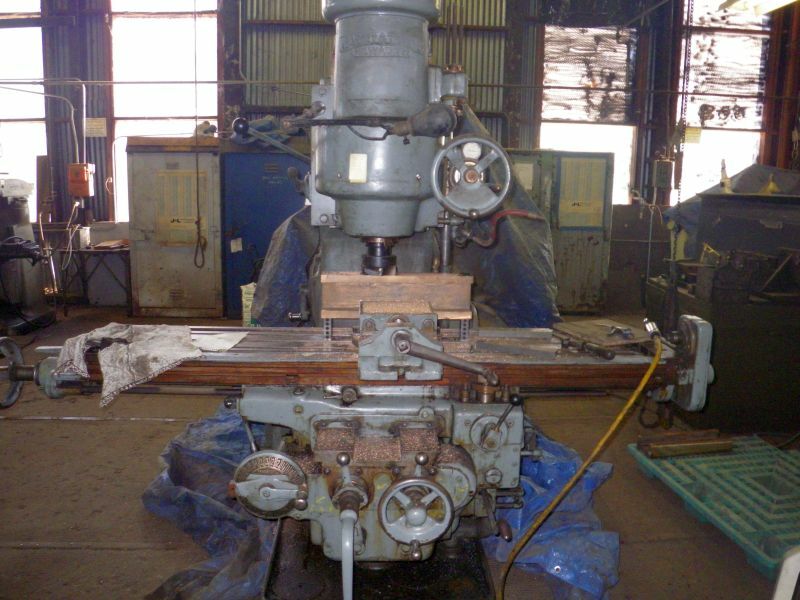 The mill was rented from Climax Portable Milling Machines in Newburg Oregon. Quite a learning experience, thanks to Ken and Glen and other who stopped by or have supported in other ways. A busy Saturday with a great turnout of volunteers at the site worked on wheel measurements, work area preparation, painting, assembly of a press, welding, and even rust (we have lots) removal. The highlight of the day was the re-installation of reproduction builders plates on the locomotive boiler. 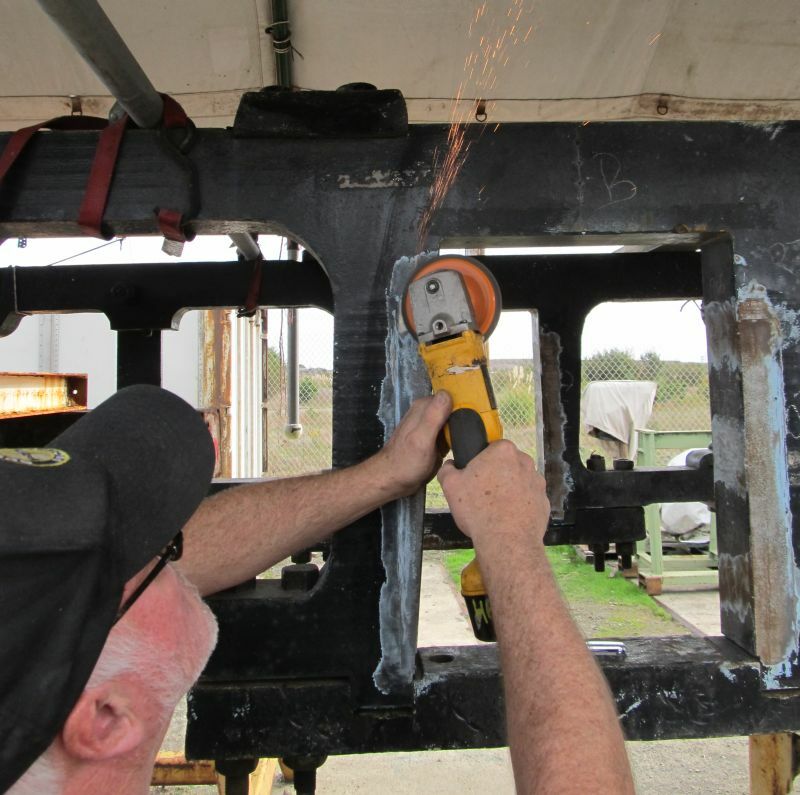 Cris attaches the plate with the help of John in the smokebox. One of the wheel drive boxes is machined and has babbitting done at the CSRM machine shop in Sacramento. Cris, Glen and Ken performed machine work on the shoes and wedges up at the CSRM shops on #4. The Cab received a coat of blank and also temporary plastic windows. The Frame was measured and also ground flat in preparation for the new shoes and wedges to be installed starting the reassembly process. 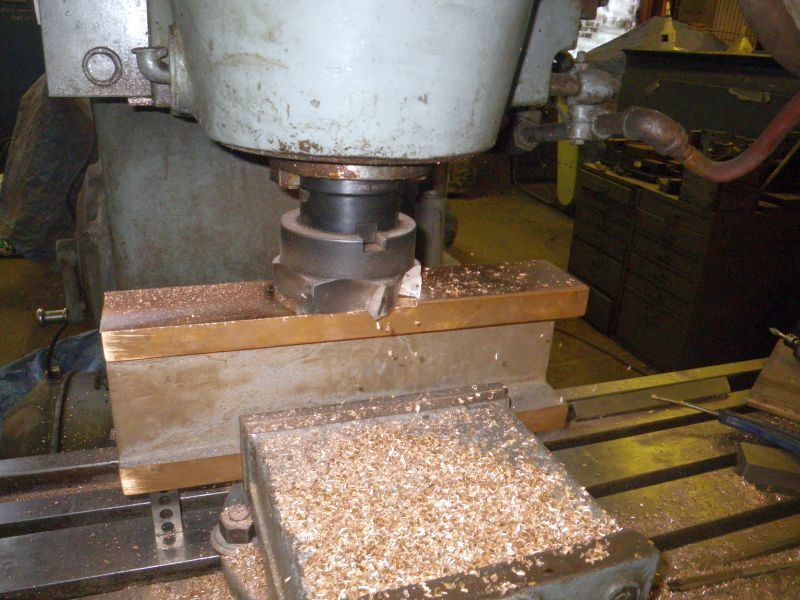 But don't worry..this grinding process is very gradual and the tolerance is within .003". July 2011 - Ready to turn! 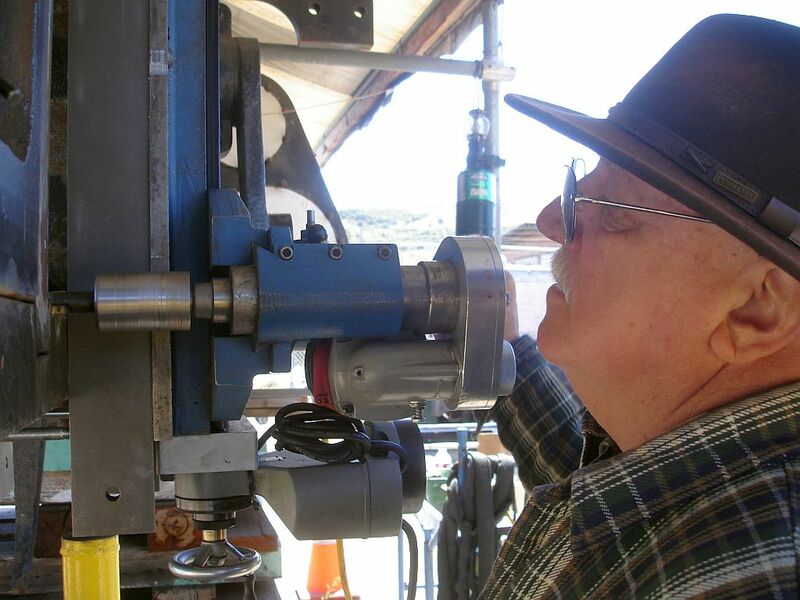 Cris makes measurements on the axle in prepearation of turning to the final diamater. One axel was found to need additional turning which will be done in September in the east bay on a large lathe. Also in July, Ken and Glen were on site helping with the precision measurements for the shoes and wedges. They are using the tool that Ken Brunskill made plus a set of calipers to measure pedestal to pedestal distances as well as measuring the hub line relative to the back of the tire. We are nearly 100 years to the day when the #4 engine set its wheels on San Francisco's rails. July 27th was the exact date she arrived. To pay a tribute to this we've planned a small party on Sunday July 31st. There will be a reception at the engine restoration site on bayshore from 2-4PM and buffett from 4-6 PM at the 7 Mile House which is right across the street at Geneva and Bayshore. Southern Pacific's Bayshore Yard and Roundhouse, San Francisco Trains, State Belt Railroad #4, and the San Francisco Bay Railroad were all featured in a video segment on CBS Channel 5's EYE ON THE BAY on May 24th. Back on TRACK, first driver ready to roll! The track panel has been constructed and pulled into position under #4's frame. The first driver was then re-railed to the track and positioned to be rolled under the frame. The frame needs to be jacked up a bit more for clearance, then the next two drivers can be re-railed and rolled to position. This is the start of the reassembly and an exciting time for SF TRAINS! Come out and lend a hand. A low profile (steel ties) track panel is being assembled to slide under Number 4's frame which has been jacked up. With the rails under the engine, the driver wheels will be placed under the frame and reassembly of the journals and springs can occur next. 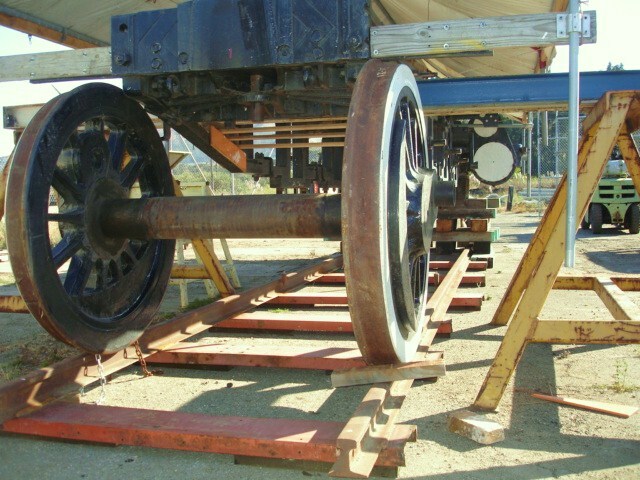 This will enable the start of the reassembly of the locomotive. On Sunday August 1st, San Francisco Trains hosted an Open House at the work site. 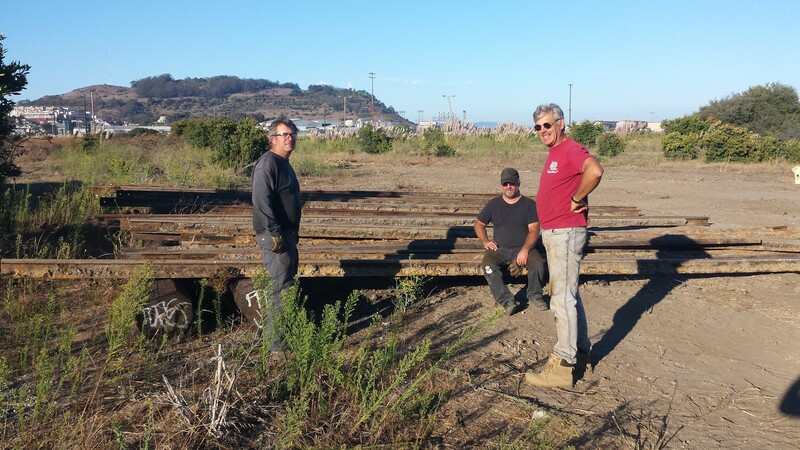 Community members, volunteers and also former workers from Southern Pacific's Bayshore shops all visited the site and inspected the locomotive, recent progress, and also the roundhouse. Only one step left to go until the Roundhouse is listed on the National Register of Historic Places! On January 29th the California Commission of Historic Places approved the building is worthy of this status, and sent the docket onto the Department of the Interior. When listed on the national register, the site automatically is entered on the state register. Helping this along the way was a resolution passed by the Brisbane City Council endorsing this nomination as prepared by Architectural Historian Richard Brandi, (working pro bono) Much credit is also due to the people who lent their talents, including Randall Ruiz, Kyle Wyatt, Brisbane City Staff and State Department staff. A copy of the nomination is available on request. 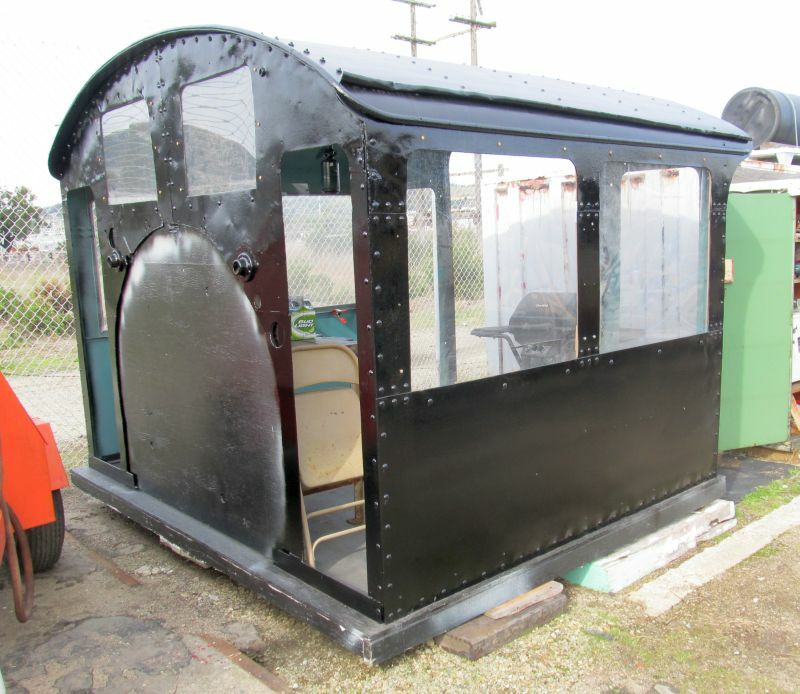 San Francisco Trains will exhibit artifacts from the State Belt #4 and Bayshore Roundhouse on October 3rd and Brisbane Community Day. That is from 10am till 4pm and is on Old County Road in Brisbane, a block in from Bayshore Blvd. Beside our exhibit there are other community groups including San Bruno Mountain Watch, food and games...and the Soap Box Derby! 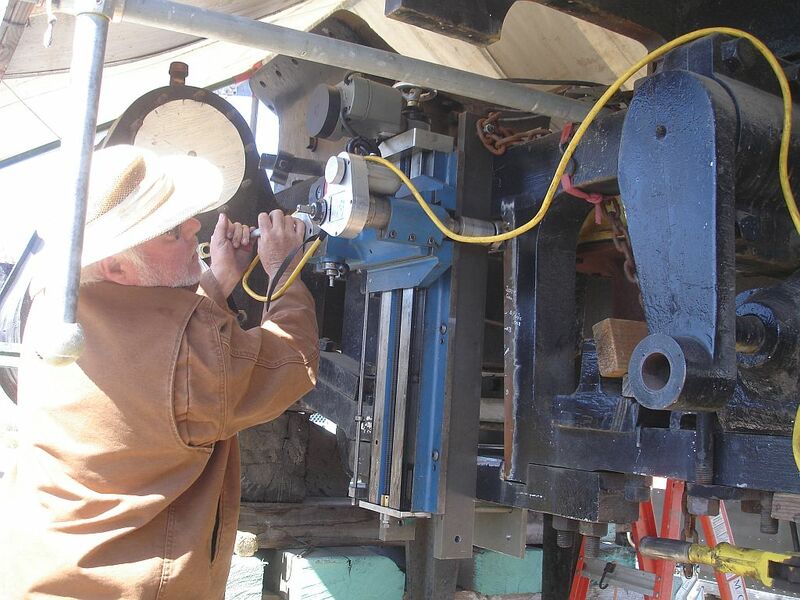 A tremendous accomplishment; A steam locomotive restoration on historic property. The State Belt #4 with the Bayshore Roundhouse in the backgroud. It's been 50 years since steam engines were regularly serviced and rebuilt at the shops in Brisbane. This site is large enough to position the engine in a manner to finish the restoration that has been held up for 4 years. Moving the engine took months of planning and refitting the used fencing donated to us. Expenses for the crane and trucks on April 18 were quite a setback, please consider making a tax deductible donation to help us cover the $4000 cost. Architectural Historian Rich Brandi has been researching the significance of the Bayshore Roundhouse in the quest to have the building placed on the Register of Historic Places. This is a positive step not only to preserve the building but a lever that can be used to secure funding and tax incentives when development starts in Brisbane. Rich has written successful nominations in the past, has a family history connected with the SP shops and Visitacion Valley Community. We met at the Society of Industrial Archeology Conference in June 2008 when Rich gave a presentation on the former SP route to San Francisco. Volunteers have worked during some very wet weekends but the turnout has been strong! A sign of encouragement is the Bayshore roundhouse next to our new site. 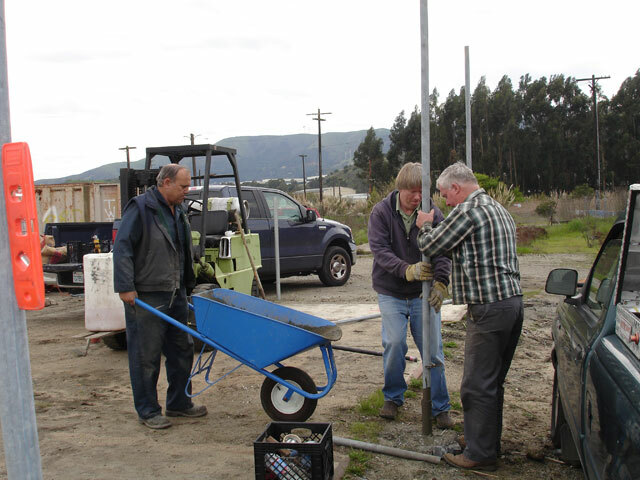 One some weekends we logged 100 person hours removing old fencing in the parking lot, salvaging different sized poles, gates, chain link fence. All the poles are in place and the push to get the fence and barbed wire up begins on April 4th. Dave Hannigan, John Goldie, Jay King (all 3 pictured above), plus John Fenlon Paul D'Orazio, John Fuller, Paul Kinneman, Vern Bruce, Cory Clar, Ralph Bennett, Brett Tallman all deserve a hat's off for the effort. We also want to thank JC and Jerry of Construction Services and their associate Kevin for support as we leave the Schlage Lock Site behind. They have been accommodating of our non-profit budget and schedule, and were able to give us the excess fencing around the back of the Schlage site for our new location. One step closer, we hope, to a permanent home, we are moving the engine by the Bayshore Roundhouse to the concrete pad 150 feet from the northeast corner of the building. Free use of the space is being donated by property developer Universal Paragon Company, and an interim use permit to occupy and proceeed on the restoration for 4.5 years was approved by the Brisbane Planning Commission. The level foundation needs to be cleared of debris and fenced with the next several weeks. A site plan for the level space includes orientation for locomotive engine to be reassembled. Boiler, Air tanks and more have been painted over the last month! 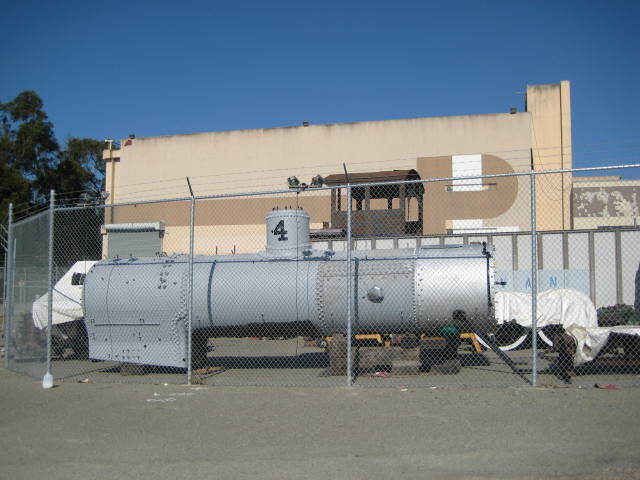 The boiler is painted in high temperature service coating and sports a number 4 on the steam dome for the curious passebys on foot or when viewed from Caltrain. The smokebox is also painted, and front handrails and bell cradle are up. 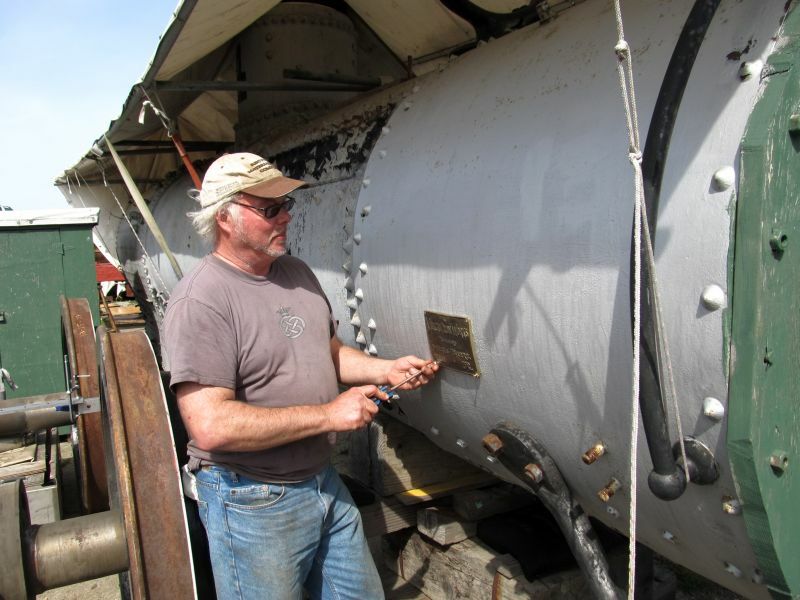 Volunteer John Fenlon has undetaken the task of painting nearly every component we can move around in the yard, including the airtanks, many many feet of steam and airpipes, brake rigging, and the tender truck which is being reassembled. Visitors are even stopping by! Engine number recreated! Thinking that we'd have to guess on the actual size the #4 that was on that numberboard, we were suprised to find the finely scribed lines on the circular plate when getting it ready for repainting. Faint but tracable, the actual size number was transferered to a clear sheet of plastic then tranfered to a plate of brass, and the number was milled by volunteer Willie Cashman. The old saying goes, the least expensive restoration method is to jack up the numberplate and roll in a new engine. With no more new Vulcans, well just keep plugging along with what we have. Tender oil tank painting done. This was the first major component painted entirely with POR 15 rust converting primer. It is difficult painting final coats in the dusty outdoors so the ideal method turned out to be painting in the early morning before the windspick up. The last component of this is the replacement lid. 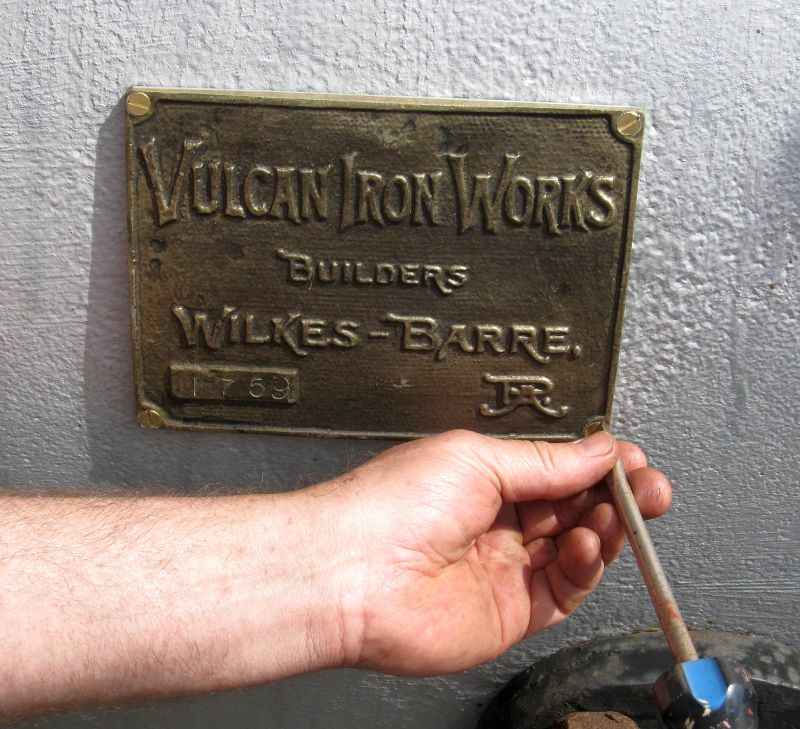 The drawings don't show the exact parts the hinges were made of and oil burning Vulcans are very rare. 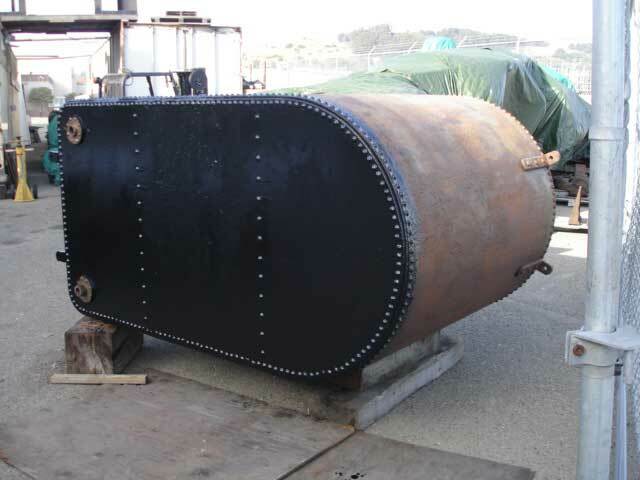 We made some progress on the tender oil tank. Starting from the bottom up! The underside of the tank was fully prepped and painted with POR15, an amazing paint that converts rust to a bond and is considered the best paint on the market for preservation of metal. Next is painting the sides and top, making a new cover, new latches, and reinstalling the valves. Thanks to Ian Hart and John Fuller for their hard work prepping, and to Dave Hannigan and Jay King for helping turn the tank onto it's side so we could access the bottom. Here's when you can come out and join in preserving history firsthand! Work hours 9am-5pm or other if requested. Volunteers will need to sign liability release. There are no creature comforts at our work space but we can support the neighborhood businesses for snacks coffee and lunch. We're at 200 East Sunnydale Avenue in San Francisco. A winter break from the Vulcan restoration is helping repatriate the British railcar orphaned in San Francisco following the Flying Scotsman USA Tour early 1970's. http://www.sanfranciscotrains.org/flying-scotman-observation.html The railcar will be loaded onto trucks on Saturday January 13th, first step on it's way home. New Tarpoline covers have been placed over the drivers, frame and boiler for protection during the winter months. Thanks John Fuller and Marty for helping out with this task. The engine was moved smoothly, the entire process went well and we want to thank Dave Roth, John Fenlon, & Ed from the GGRM, volunteers Vern, Brett, Cris, DJ and John as well as our hired companies South Bay Crane and S&R Trucking, and in kind donation of service from Target Logistic organized by Chuck Meier. The engine, our two support/storage containers and supplies are in the fenced lot, and the tender frame and water tank sit across the former house lead to Bayshore Yards. Right away: Pack the containers as full as possible. Stack outside materials and cover. Make room for work areas, and install active solar system including panel, regulator, batteries, LED lighting at site. 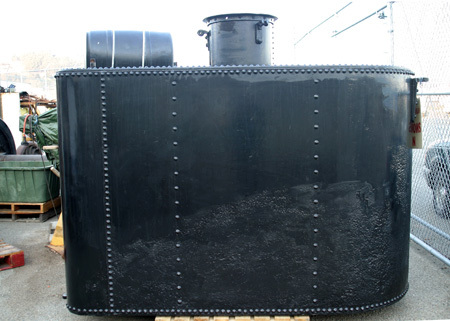 Preserve the boiler, tender oil tank, locomotive air tanks by wire brushing and painting the exterior, and capping and sealing the interior. Complete reassembly of tender trucks for static display of tender. Seal engine cylinder from the weather. Level engine and construct short sections of track under her to allow the drivers, driving boxes, shoes and wedges to be fitted up under the engine. That should keep us busy for a few months! Expect the engine and tender to be moved on the last week of July. The engine and tender and container will be moved on Wednesday, and the balance of small stuff on Thursday and Friday and hopefully nothing on Monday. We expect that South Bay Crane and S&R Trucking will put in their usual 110% effort. Target Logistics has offered in-kind donation by transporting the palletized components that will fit in their bobtail trucks. Our new location is on the border of San Francisco and Brisbane on East Sunnydale Avenue We are 100 feet away from the lead track to the former SP Bayshore yards and situated between two important rail locations: The Caltrain Bayshore Station and the end of the new MUNI Third Street Light rail extension. We have received our EIN number from the IRS, recognizing us as a legitimate business. A new location is being prepared for the Steam Engine. The plan is to finish the move before July 31st. More details will be posted here soon as the paperwork is finalized. 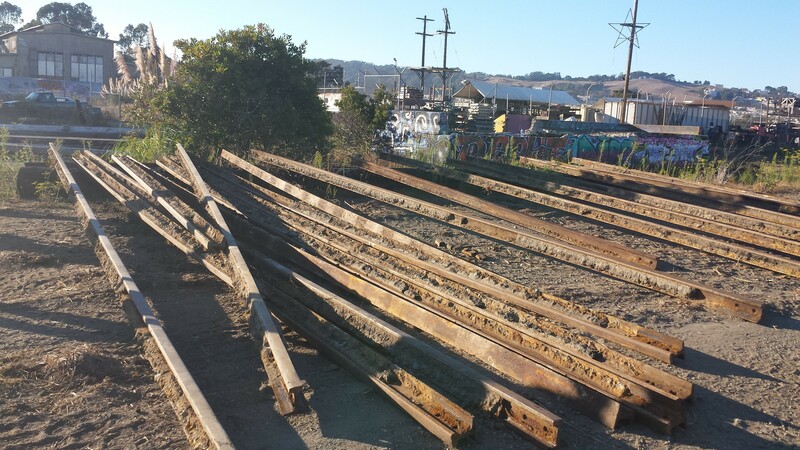 San Francisco Trains wishes to thank Budget(aka Cedent) Rent A Car and the City of South Francisco for allowing us a temporary extension for keeping the engine and containers storing parts at the lot in South San Francisco. We are still looking for a long term solution for keeping the engine in or around San Francisco. Our storage lot in South San Francisco has been discovered to be a problem. Three months after arriving we found that the city would not permit the land for outside storage. Once again, the upmost urgency of finding a home for the engine is apparent. Click on the ["contact us"] link for more information or to offer help. Though not directly train related, the <html><a href="http://www.musicconcourse.org/">Friends of the Music Concourse are giving a presentation at SF History Day on April 30 at the San Francisco County Fair Building (corner of 9th ave and Lincoln Way). $10 advance, $15 admission at door. The presentation will include "an illustrated talk on the history of the Music Concourse will show the Concourse as it has developed over the years, since it was first the site of the California Midwinter Fair of 1894. After that, we will give an account of the actual steps involved in landmarking the Concourse, including the documentation, public outreach, neighborhood support, preservationist's involvement, and public hearings. This presentation will also be of interest to those who would like to landmark a building, a statue or even a fountain." 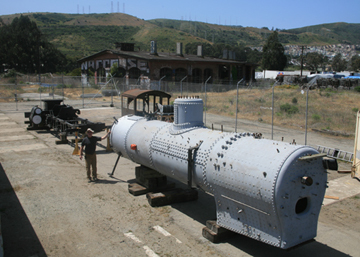 State Belt #4 in South San Francisco: The engine and tender are in storage in South San Francisco. Thanks to all who helped in the process: John Fuller, Jeff Capretti, Tom Kehoe, Ian Hart, Dave Johnson, Cory Clar, Brian, Kevin, Golden Gate Railroad Museum participating members: Vern Bruce, Jay King, Dave Hannigan, Dave Roth, and the GGRM board for providing funds for expenses over the volunteer efforts. San Francisco Trains has filed Articles of Incorporation to become a 501c3 non profit. The whole process will take perhaps 3-5 months. We are grateful to a Law Office who is handling this incorporation for the cost of the filing fees only. In our continuing quest to find a home for the #4 and the flat cars, we are making a presentation to the Treasure Island Development Authority. As some of you may know, the State Belt #4 was used on Treasure Island to deliver goods to the exhibition in 1938 and 1939. We will post more news about this as we get it.